We have published three versions of this map, showing how the area developed across the years. The maps each cover the same area, stretching Lordship Road eastward to Springfield Park, and from St Ann's Road and Crowland Road southward to Manor Road and Windus Road. The maps therefore cover the southern part of South Tottenham, much of Stamford Hill, and also the Clapton Common area. Stamford Hill, leading to High Road, runs south-north through the centre of the map. Features include West and East Reservoirs, Amhurst Park, the Tyssen Amhurst Estate, the Craven Estate, the Springfield Estate, South Tottenham and Stamford Hill stations, Tee-To-Tum Club, tramways and depot, Springfield House. The River Lea is at the east side of the map. The three maps provide a vivid contrast as the area is developed. The map links up with London Sheets 13 Tottenham to the north, 20 Finsbury Park to the west, 22 Walthamstow Marshges to the east, 30 Stoke Newington to the south. 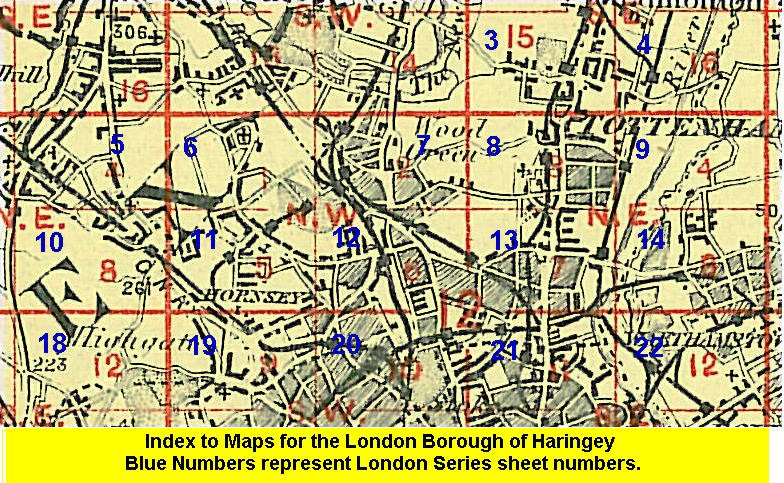 Follow this link for a list of our maps for the London Borough of Haringey, or here for a complete list of our London maps .